On a cloudy overcast Saturday in Southern California, Century Paving asphalt repair crews were busy working at a local Waste Treatment Facility. The scope of the project was to perform 6″ of asphalt removal and replacement. Since the facility’s operations are very busy during the week it was important to the client to schedule the work on a Saturday. In order to perform the removal in a quick and efficient manner a 4′ Wirtgen cold milling machine was used to perform the removal. On this day approximately 200 tons of grindings were generated in approximately 1.5 hours. 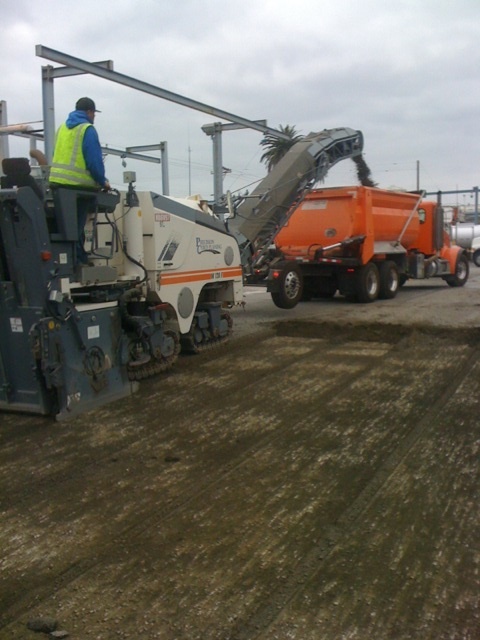 After the milling, the crews will clean the loose grindings and prepare for asphalt paving.